Chris Jones has been working on a small little project that you might enjoy and it’s called Lifesaver. 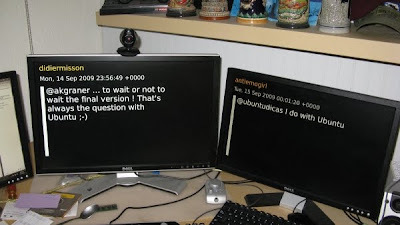 The idea is really simple – it’s a screensaver for GNOME that displays recent posts about Ubuntu from Twitter and Identi.ca. That’s it! The code and bugs and downloads live on Launchpad, and packages for Ubuntu 9.10 (Karmic) are in Chris's PPA.